"This is a relevant primary source for undergraduate courses on a variety of early modern topics, including the Reformation and the roles of women in early modern Europe. It will give students a sense of what life was like in a sixteenth-century convent; . . . a specific understanding or how the Protestant Reformation offended faithful Catholics; and a vivid pictue of the kind of struggle that could occur when cities chose to become officially Protestant. . . . Klaus’s translation will immeasurably enliven and enrich any course on sixteenth-century Europe or early modern women. It will help bring the divisiveness of the Reformation and the experiences of early modern women to life not only for undergraduates, but for all readers." 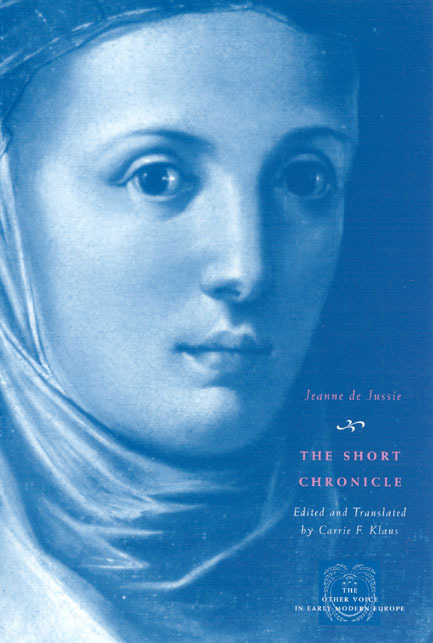 "[The chronicle] presents the early stages of the Reformation through the eyes of a despairing, frightened, but ultimately brave woman. It has great value as that. . . . It is a rare treat when historians and students of Reformation or religious history are presented such materials." "Excellent material for courses in women’s history and Reformation religious life." "This translation is a work of art thast truly provides a comprehensible, living voice. . . . Jussie’s is an individual perspective with which students should be able to identify, and the descriptions of ritual, piety, violence, and verbal exchanges make for compelling reading. . . . I am thrilled and grateful that, because of the affordable price, I will be able to read it with students in my Reformation history courses."